This old news, but we've been bad about posting. 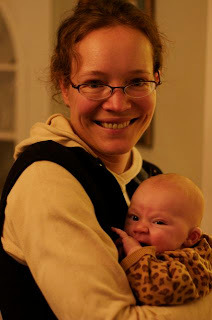 Anyhow, after Thanksgiving, my dear friend Sus came to visit and got to meet Margot in her post-birth state (ie: not kicking in my belly). It was incredible to have a friend who I've known since middle school meet my child. I mean, I know that I'm a parent, but seeing my child in the arms of someone who I remember being 12 with really brought things home. My inner child was forced to recognize the existence of my outer adult. Scary! Here are two photos of them together. 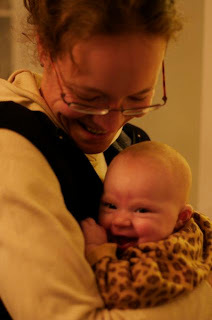 I especially love the one where they are both laughing even though it isn't quite in focus. I feel famous! Really, it was Adam who was making her smile, but I was happy to be there for it! My love to you all!